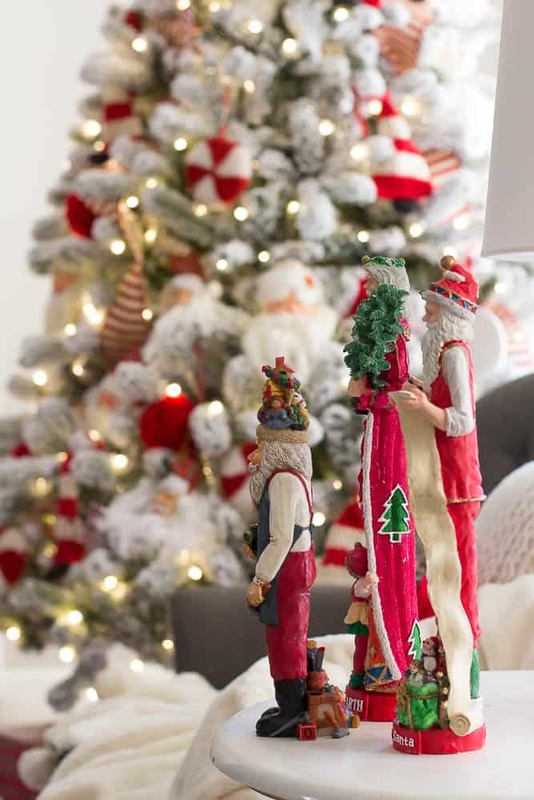 I am so happy to be a part of this Christmas Tour of Homes where a group of bloggers are showing you how we decorate our homes for Christmas. We hope that when you visit all of these homes, you will find some inspiration to use in your home. This home tour is hosted my dearest blogging friends. We connected at the Haven Conference in Atlanta in 2016 and 2017 and have become true friends that I love dearly. Now on to the Christmas home tour! Merry Christmas and welcome to our home! I think my home has mostly traditional Christmas decor. I kept my front porch decor rather simple this year. I can’t decorate outside very much because my dog thinks the decor is for her to drag around the yard so I can only put out heavy stuff that she can’t move. We use to put up a lot of outside decorations but the dog shut that Christmas tradition down. I did score the sled and the skates at a thrift store and as I drove it around in the buggy, everyone that saw it was so sad that they didn’t get to it first. 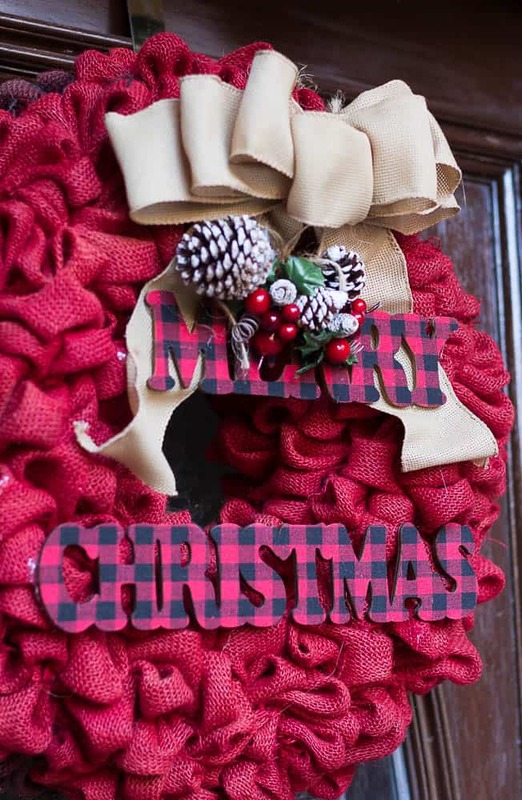 The Christmas wreath is a DIY project that I made a few years ago. 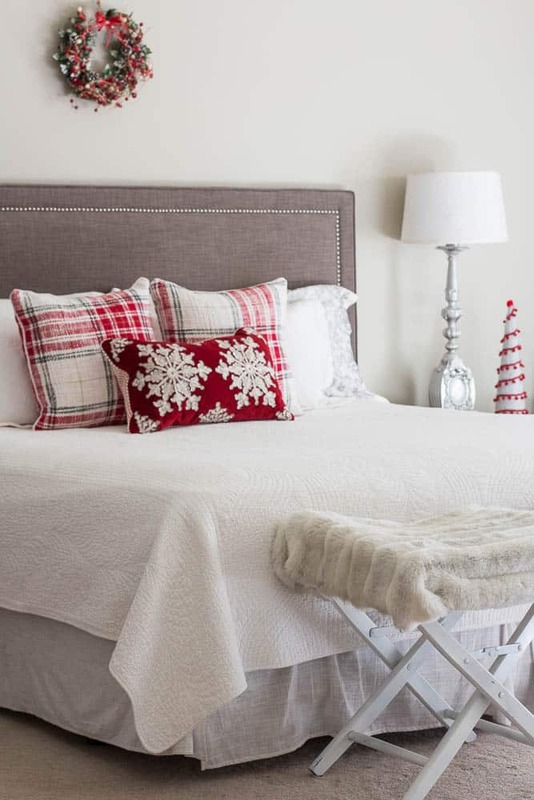 I love all of the rose gold and metallic Christmas decor that is so popular but for me, it will always be traditional red, green, and white colors used in my home. Those are the Christmas colors that I am drawn to. Those are the colors that always catch my eye in the stores. Our 14 year old tree died last year so we purchased a new tree and it is from King of Christmas. I saw the Christmas tree on Instagram and knew that it was the perfect tree for us. It is almost effortless to put together. I love how tight the limbs are to each other and the flocking is beautiful. The tree barely shed the flocking when we put it together. For years, our tree had all of the Christmas ornaments that we had collected over the years plus all the ornaments that my kids had made. I always said that I didn’t want my tree to look like a decorated tree at the mall. I wanted my tree to hold all of the Christmas memories that were dear to me. Now that my kids are grown, I have changed things up and I really am enjoying decorating the tree diferently. 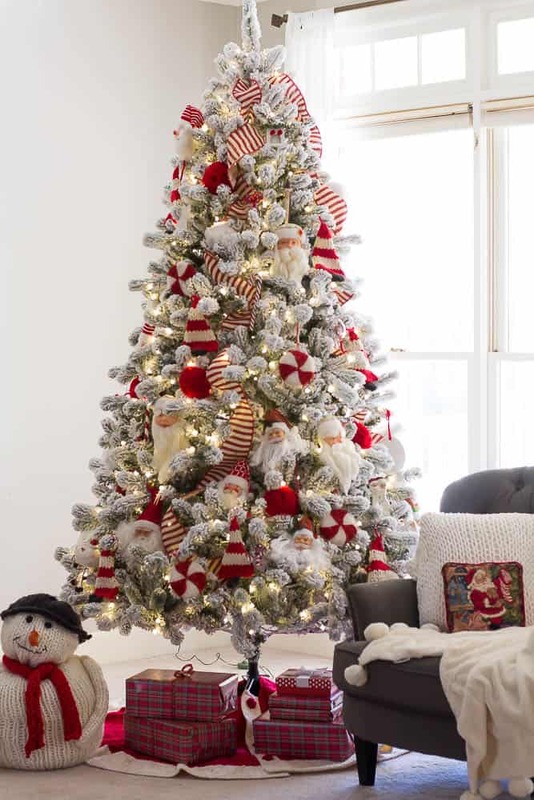 The red and white striped ribbon was the first thing I purchased this year and I decorated my tree with mostly bright red and white ornaments. I knitted this Chunky Knitted Snowman this year. 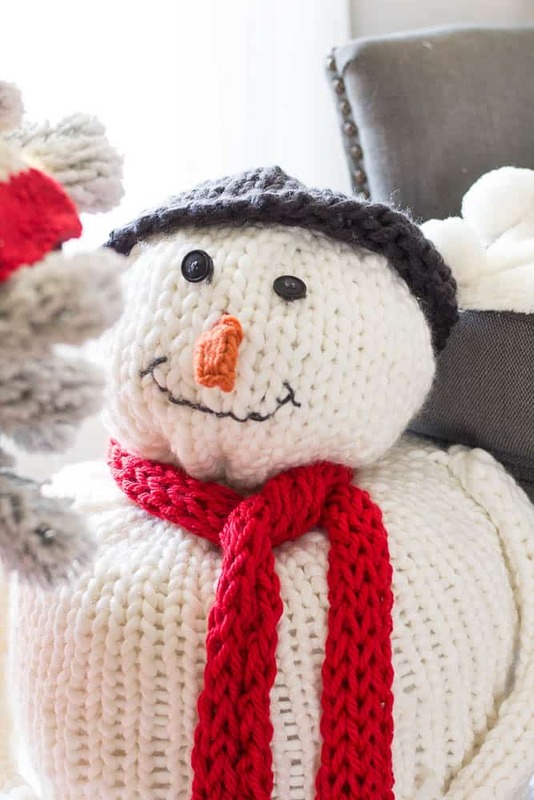 Since you use large needles and chunky yarn, the knitted snowman is quick to knit. You can view the tutorial and pattern. I have been purchasing Santa ornaments for a few years and these ornaments make great fillers for the gaps in the trees. I am loving all the knitted and homemade ornaments that I am seeing everywhere this year so I knitted some Christmas Trees to go on my tree. You can view the Knitted Christmas Tree Banner for the tutorial. The focal point for my Christmas Mantle is my new Santa Clause canvas. I rarely make a purchase like this but I am so glad that I purchased this Santa. I do not think my family will ever get tired of him. Speaking of being drawn to things, I am always drawn to decor with Santas. 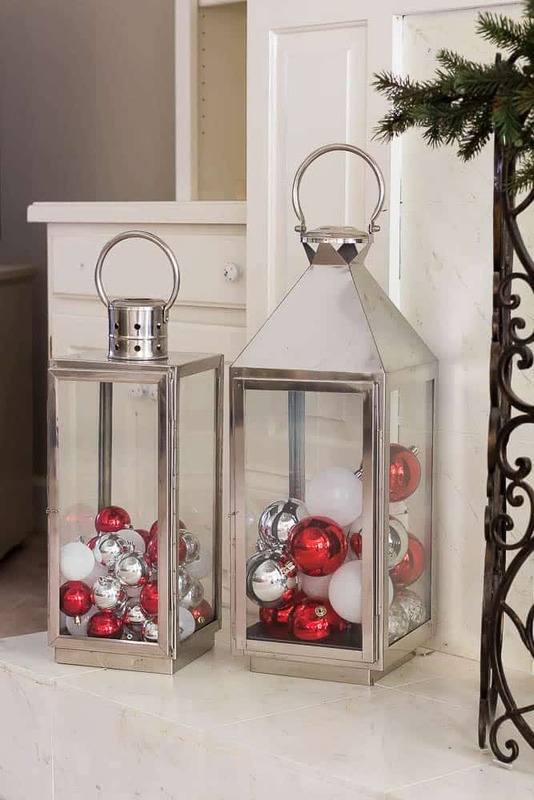 Shiny balls in lanterns are one of my favorite ways to decorate. 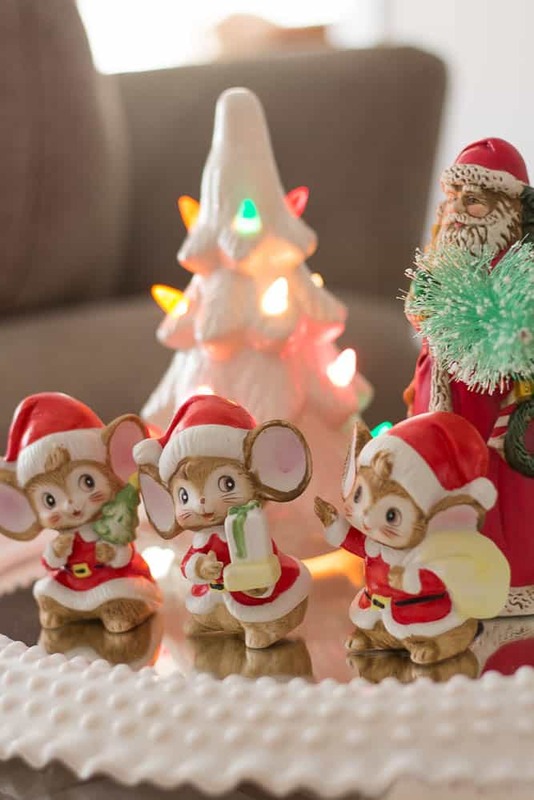 I love to use a few pieces of Christmas decor every single year and these vintage mice from Home Interiors has made the cut. These mice were probably the first piece of Christmas decor that I purchased as a newlywed in the early 80’s. I have set these mice along with the ceramic Christmas tree on a table every year. I love these Santas that I purchased from a thrift store a few years ago. The colors are so bright and vibrant. 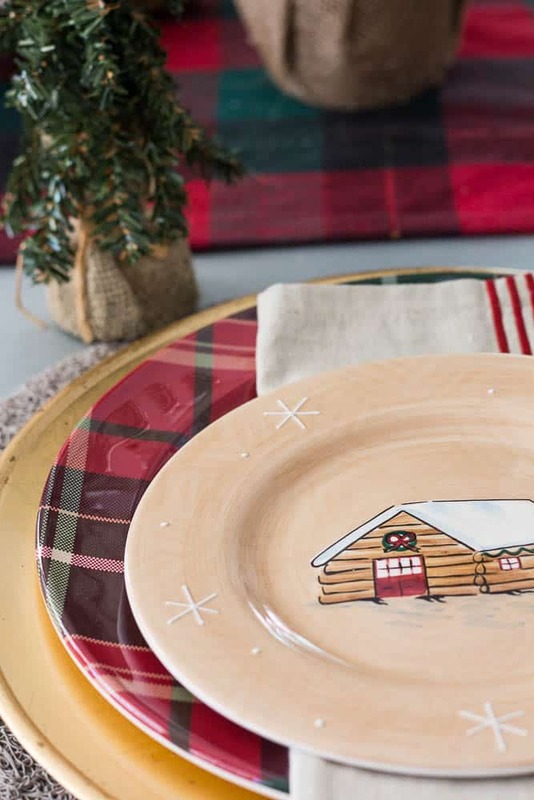 I received a set of woodsy Christmas dishes from my late father-in-law years ago and I use a piece of the set on my Christmas table every single year. 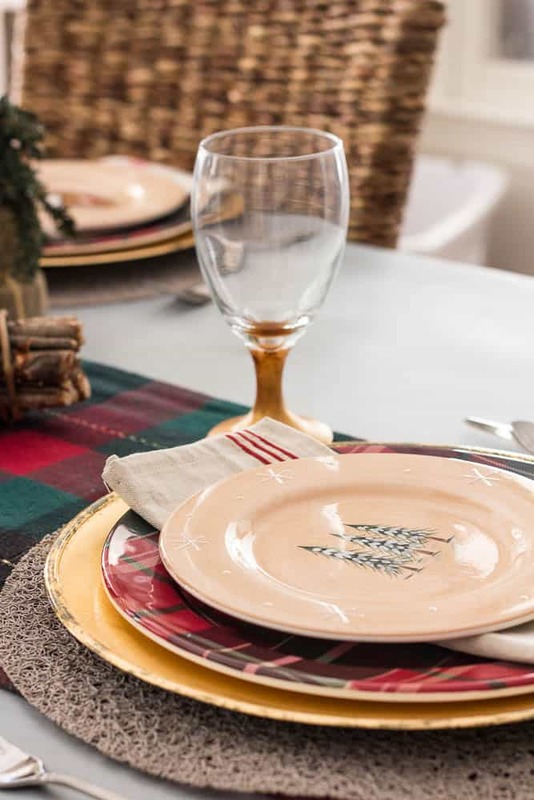 This year I used the salad plates and paired them with some plaid dinner plates. I also used some gold chargers that I have had for years. 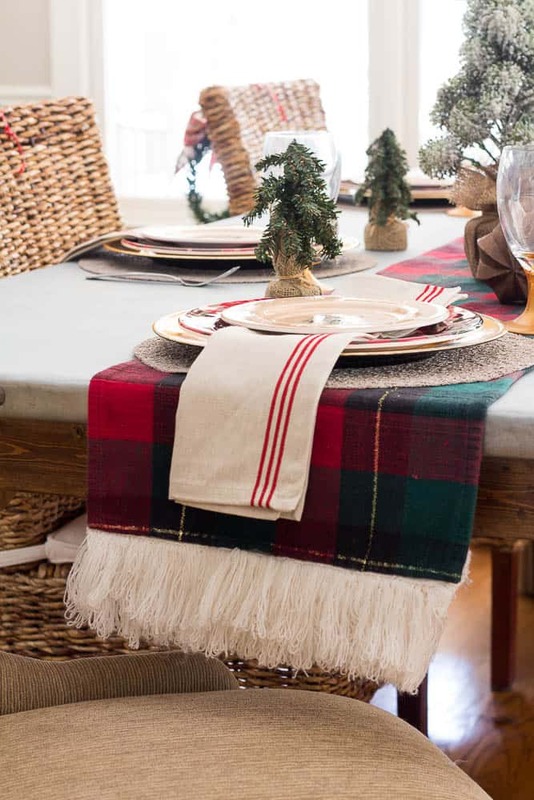 I made a DIY Table Runner with an old plaid runner and the fringe from a thrifted poncho. All of the small wreaths on the back of the kitchen chairs are made from one dollar store garland and some ribbon that I had. Pretty cheap decor. 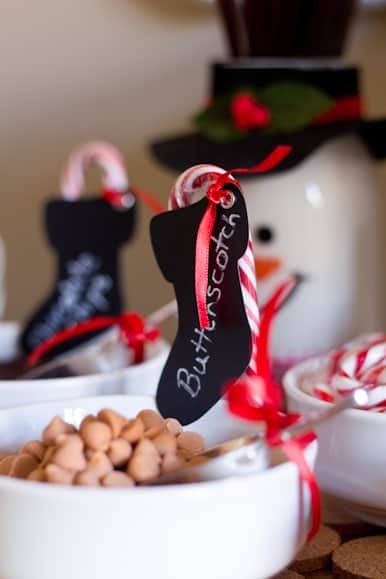 I usually set up a hot chocolate and coffee bar right off my kitchen so that we can whip up some hot chocolate while we watch cheesy Hallmark Christmas moves. Every single night.. 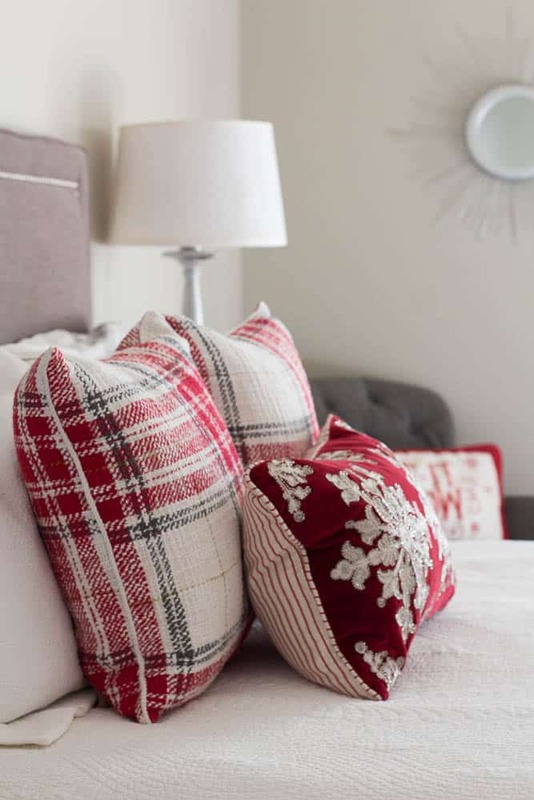 I love something about red Christmas pillows on white bedding. The red just pops! I use to not decorate my bedroom but I have started putting out a few pillows and it makes me smile every time I walk into the room. I like to have Christmas spread throughout the house. 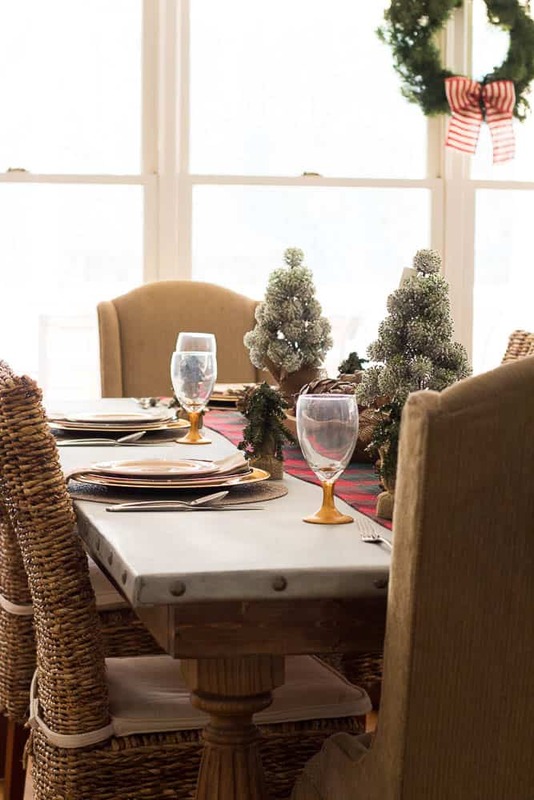 I hope you enjoyed my Christmas Home Tour and I hope you will visit all of the other blogger’s homes. I know that you will be blown away with their decor. Sherry your home is gorgeous! I love that there is a theme of Santa throughout! That tree is just stunning. Very pretty, Sherry! 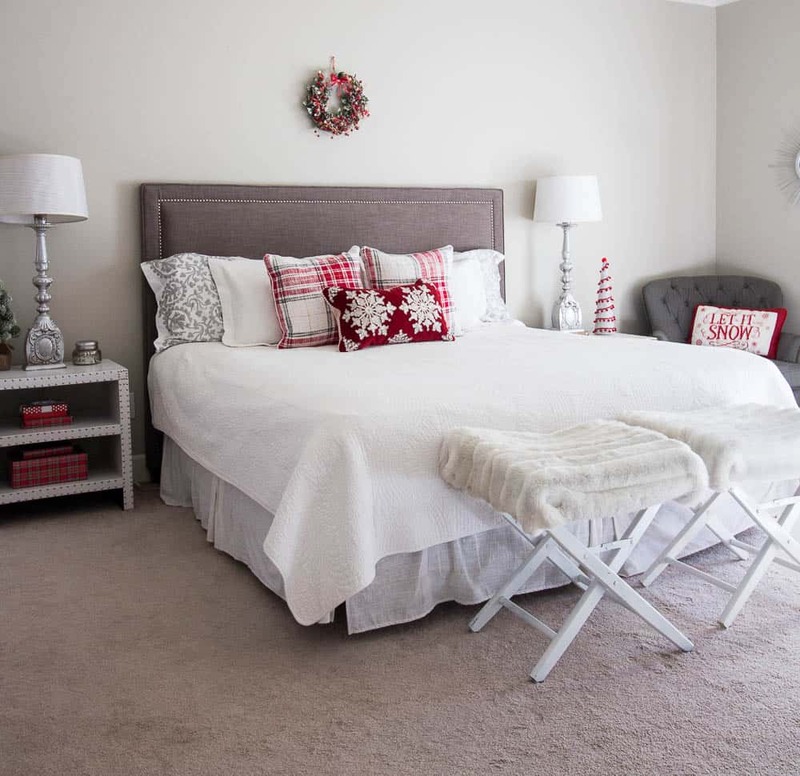 You have a beautiful home and you are rocking this blog! Your tree is gorgeous along with all the little touches. I really like the contrast of your white curtains to the wall color. Sherry! This is so very beautiful! I am loving all your knitted items! What a way to invoke coziness! All the details are simply perfection. Merry Christmas! What a beautiful tour my friend! Love you and so very happy we met at Haven, our little group is precious. I wish I had your knitting skills! The snowman and trees are perfect. 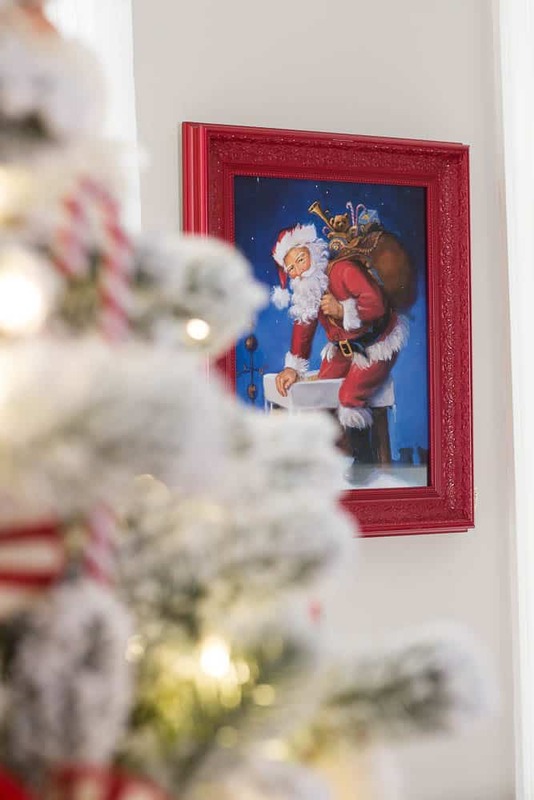 I love how the pop of red flows through your home perfectly and the Santa painting is one of the prettiest I have seen. 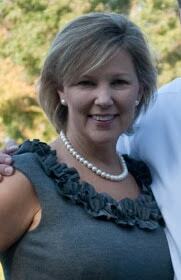 Sherry, oh so pretty. We have a sled by our front door, too! I love your red ~ so vibrant ~ against the white. You so many cute pieces and every spot is filled with wonderful things to look at. Such cute Santas. 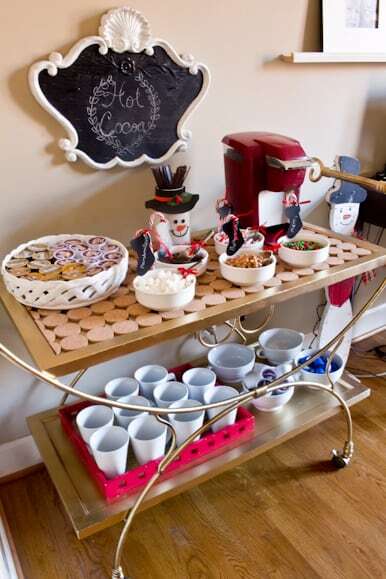 Love the hot chocolate bar! It’s amazing how wonderful Haven is for bringing bloggers from all over together to become friends! 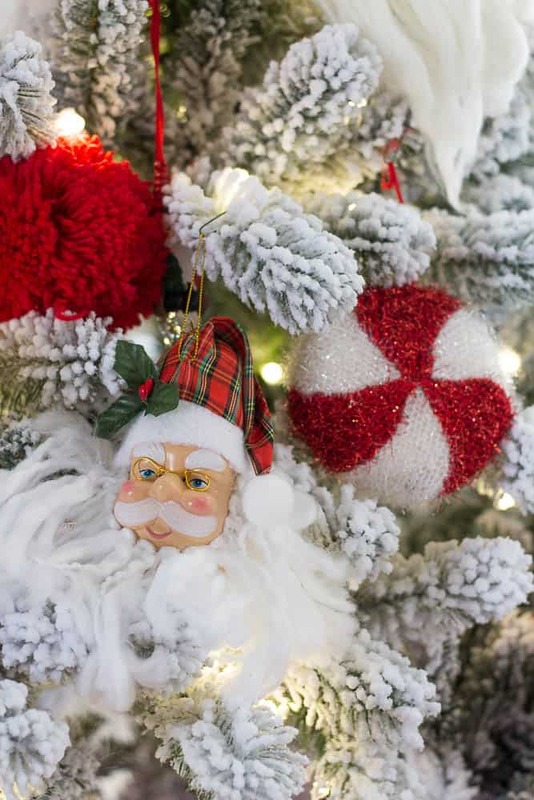 I love your Christmas touches everywhere and that knitted snowman – Wow! 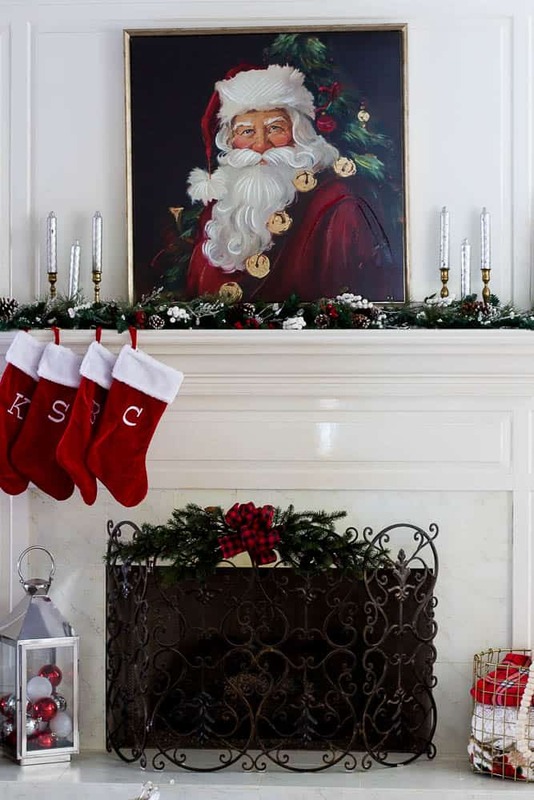 And you definetly hit a winner with the new Santa print on the mantel. He’s so cute. I laughed out loud reading about your cocoa station. I made one too and WE WATCH HALLMARK MOVIES EVERY NIGHT TOO! lol. It all looks beautiful. Merry Christmas. I wish I knew how to knit. You make the cutest things! That snowman is simply adorable! If you lived closer, I would have you to teach me. Sherry, Your red and white tree is stunning. I guess I should learn how to knit because the snowman and hats are too cute! I love your Santa picture also. Your house is very pretty for Christmas. Merry Christmas, my friend! Where to start my friend? Of course I’m endlessly jealous of your thrifting skills…those skates and sled were real score. 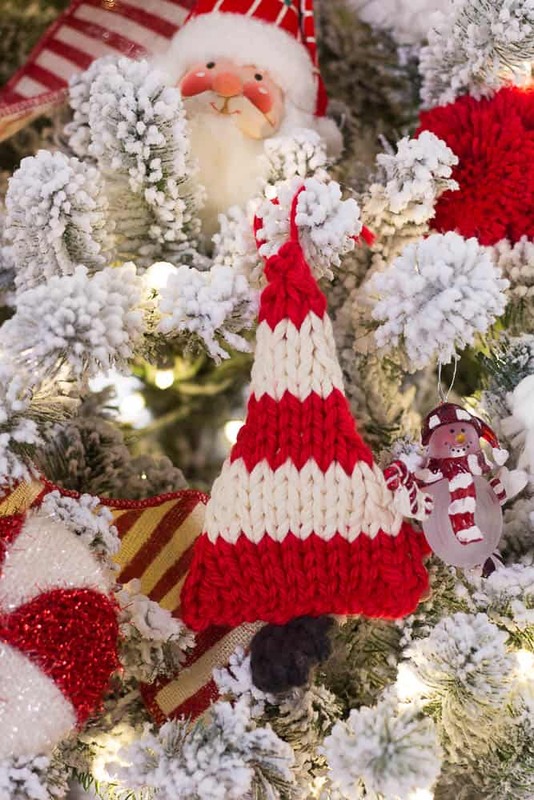 And your tree is just lovely…the addition of your knitted trees makes it really special. And you know i love a good Santa painting! How lovely that you include a part of that set that your FIL gave to you every year…what a lovely tradition. 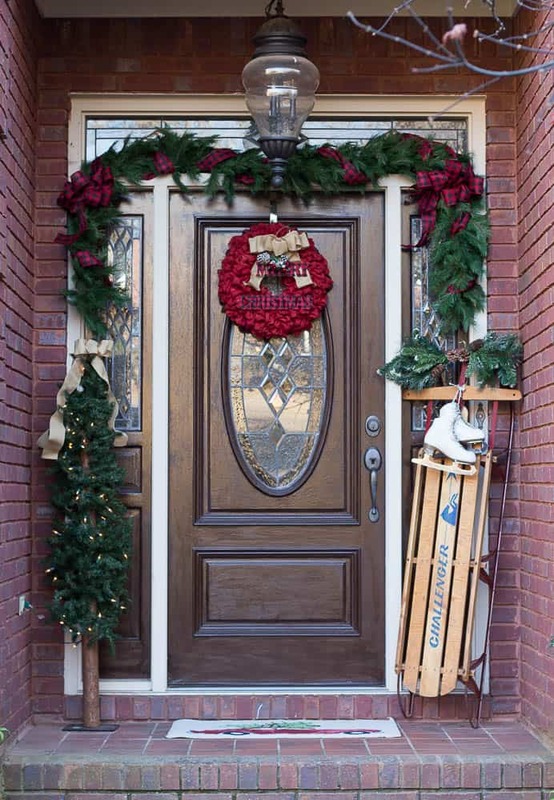 Your home is so ready for Christmas…I hope it is a blessed one. Your home is everything I expected it to be for the holidays. It looks amazing. That red and white tree is stunning. But I have to say, your images look incredible. You captured each detail perfectly! Oh this is so precious! Sounds like you have a fun challenge to find heavy decor your dog can’t lift! I just love how you decorated your tree and the Santa on the mantel. 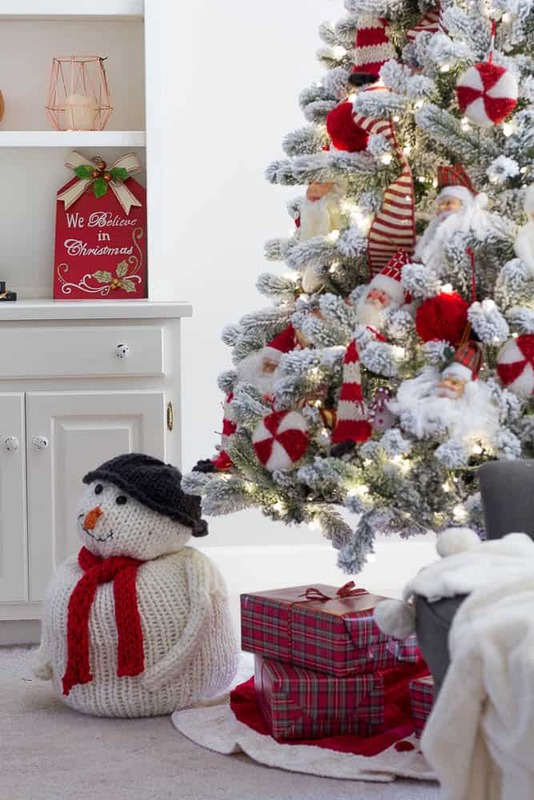 Your whole home is bright and beautiful with such fun festive touches! Thanks for the great tour! Your tree is absolutely adorable! Your Santas and the knitted ornaments are so whimsical. I want to come and have hot chocolate in your cozy beautiful home. Sherry your house looks amazing!! I love your ideas!! So simple and classic and beautiful!! I love the tree and the knitted items. Thank you for sharing!! We copied your sled idea this year!! But don’t come across the street and see the inside.. a house of crazy! !